Four fantastic pairs of earrings. I was browsing the results of a recent Phillips’ auction and I found a plethora of spectacular pairs of earrings. I thought I’d collect my favorites and lay ’em all out for you at once! Ready? Let’s start with something dazzling. These 25.36 carat amethyst earrings are by Margherita Burgener. 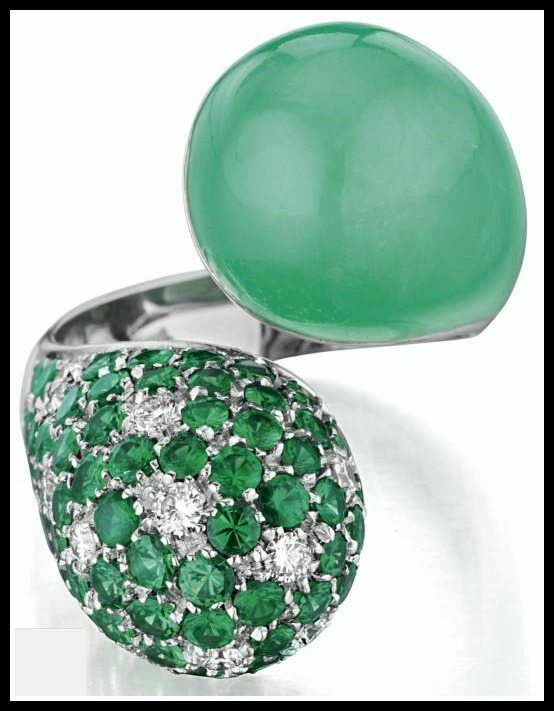 They are further embellished with tsavorite garnets, diamonds, sapphires, and more amethysts. I’m afraid they’d be pretty heavy to wear, but I think it would be worth it. Aren’t the colors magnificent? These are much, much simpler, but no less spectacular. Those tanzanite drops weigh approximately 31.78 carats in total. The pair totals just over 4 carats of diamonds, too. So lusciously cool and curved, like flash frozen drops of ocean water. Here’s another pair by Margherita Burgener; in fabulous pink and purple, no less. That’s 48.55 carats of kunzite right there, my dears. Serious stones. I have to say, however, that my favorite part is the sugarloaf amethyst surmounts. I love the contrast of the rounded stones on top and faceted drops hanging below. And a lovely, soothing pair to end on. These pretties, also by Margherita Burgener, are a vision of green loveliness. 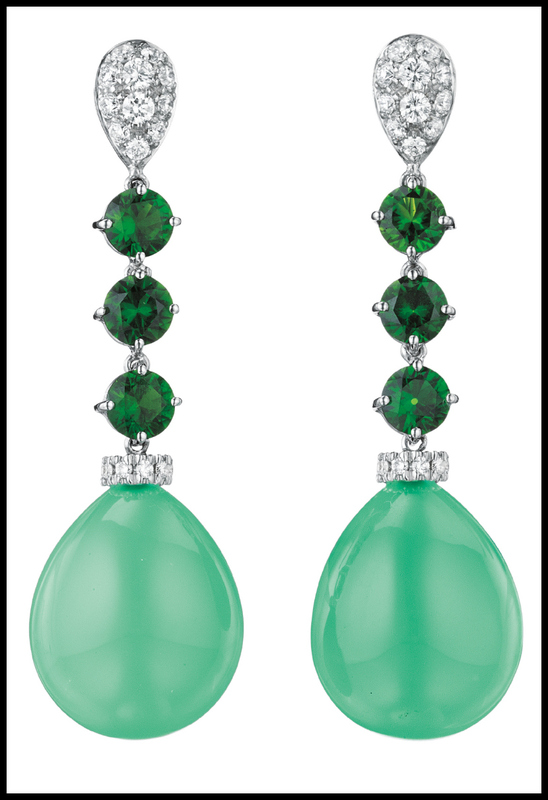 The large suspended drops are chrysoprase; and the carved, diamond-embellished surmounts are luscious jade. Those wonderful gems twinkling between the two parts are chrome diopside. I know it’s hard to choose, but I love to ask: which of these beautiful pairs of earrings is your favorite? These pairs of earrings were all listed in a recent Phillips auction. All images and info are thanks to Phillips. Margherita Burgener chrysoprase ring and earrings. The color scheme of these Margherita Burgener chrysoprase pieces slays me. They’re not sold as a set, but they were listed in the same auction and they clearly match. These earrings are simple, but oh, the colors! They’re just begging to adorn a hazel-eyed brunette (I volunteer!). 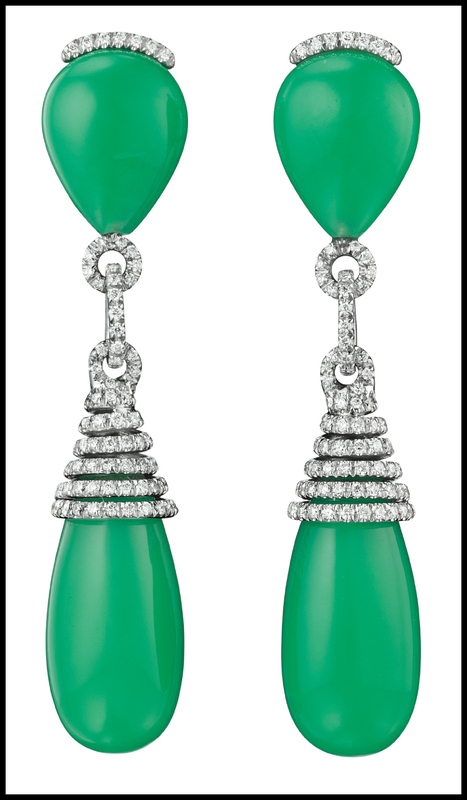 Each earring features – from top to bottom – a pavé-set diamond surmount, a circular-cut chrome diopside link, and a chrysoprase drop with a pavé-set diamond cap. The colors are bold but the size – 1.5 inches – means these beauties wouldn’t be overly loud. Have you seen chrysoprase in person? It’s the most marvelous, softly glowing green color. I nearly bought a gold and chrysoprase necklace a few weeks ago at the Maryland Renaissance Faire. By that I mean I wore it for a while while I looked at the jeweler’s other pieces and wondered which of my internal organs might be the most marketable/nonessential and then handed it back and walked quickly away. The ring is a very funky shape – a little funkier than my normal style, but the kind of piece I would admire greatly on a funkier friend. The ring is of crossover design and set in 18 k white gold. It’s set with a carved chrysoprase as well as pavé-set diamonds and tsavorites. This post originally only contained one pair of earrings, but lo and behond, I just found more that would go perfectly with the ring! And because I am super into chrysoprase right now and the color is seasonally appropriate, I decided to add more. These funky earrings involve chrysoprase and diamonds only. How amazing are those lines? So fun and fresh. At 2 3/8 inches, these earrings make a larger green statement than their cousins above. These beauties involve the same materials as the first two Margherita Burgener chrysoprase pieces, but in a different way. 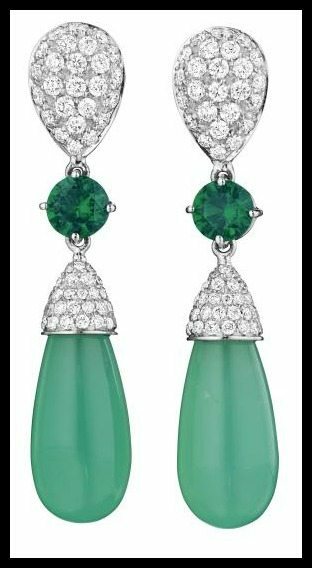 They’re slightly larger than the first pair – 1 3/4 inches long – and feature a chrysoprase drop suspended from pavé-set diamond link and a line of chrome diopside leading to a pavé-set diamond surmount. Are you as into this color scheme as I am? Which earrings are your favorite? These Margherita Burgener chrysoprase pieces were all listed in Philips auctions. Please see individual descriptions for links. All images and info are thanks to Philips.